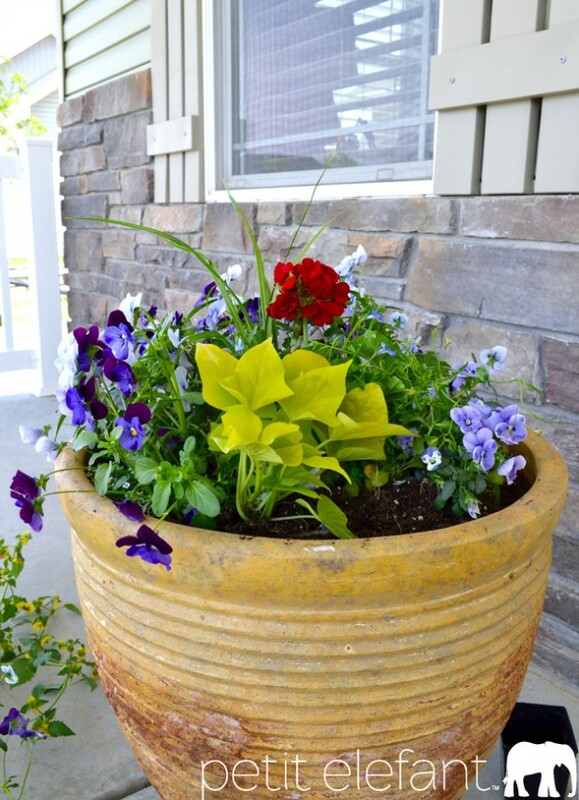 Spring has sprung, summer is on its way, and its time to perk up your front porch with a burst of color. The nurseries and garden stores are overflowing with bright, cheery annuals (those are flowers that only bloom and live once, rather than perennials which come back every year) and you really ought to get your hands on some. There is definitely something therapeutic in working with the soil and colors. Pinks, yellows, reds, purples, oranges, white…the combinations are endless. 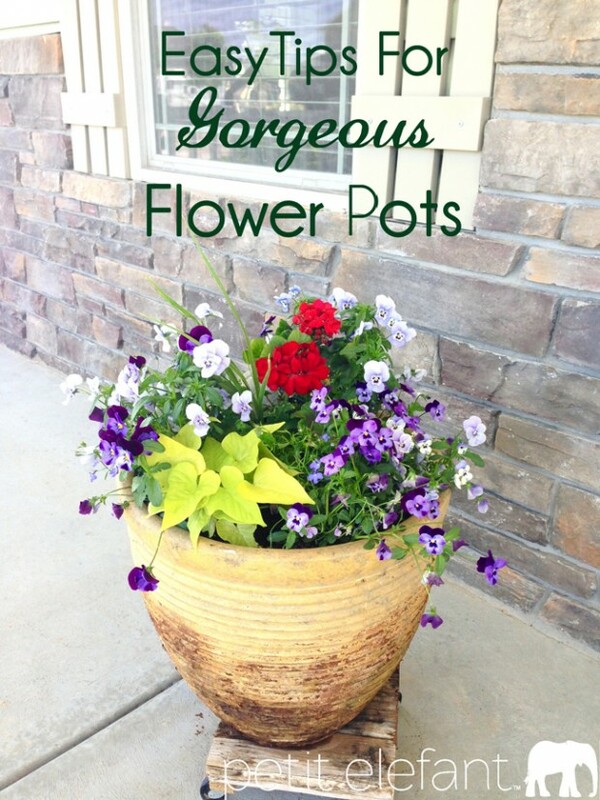 So, grab that tired old pot out of the corner of the garage or and give it some life! Follow these tips for gorgeous blooms all summer long, and I think you’ll even enjoy yourself along the way. 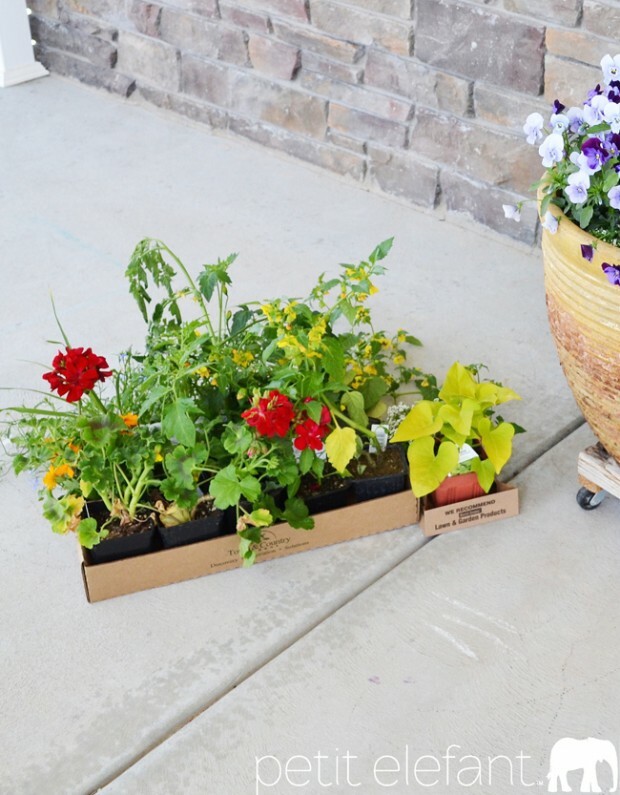 First, select your flower pots. Any size or shape will do. Make sure it’s a good size for your space and make sure it has good drainage. I’m using this old yellow one–I love the aging patina and texture. 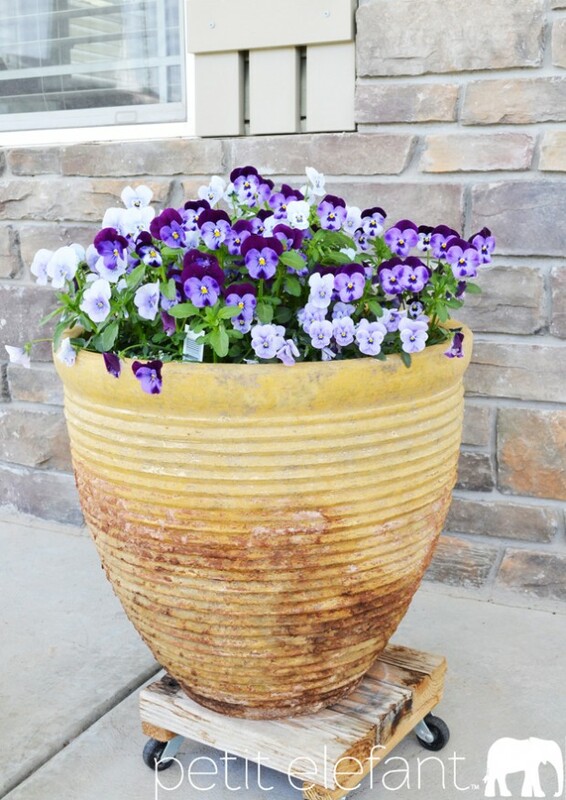 If your pot is quite large and deep, like mine, stack some recyclable material in the bottom third–old plastic flower pots placed upside down, empty aluminum cans, styrofoam packing peanuts, etc. This helps create better drainage and spares the waste of unnecessary potting soil. Collect your other materials: small shovel or spade, garden gloves, a watering can and good potting soil. Not dirt from your yard–good, loamy, fertile potting soil. Now, choose your flowers and plants. There are gazillions of options, but for today, I’m focusing on annual flowers for inexpensive bursts of color. When shopping, look for contrasts in textures, sizes, leaf shape, and color. Be sure that all the blooms you choose share compatible light and water needs, and that those needs match the space you’ll be planting them. And definitely remember these three words. Thrillers, Fillers and Spillers. Thrillers are tall showy flowers in your mix. The drama. You’ll want to choose one or two kinds, and place these in the center of your pot. I’ve chosen deep red geranium (I’m obsessed with this color) and a tall sharp bladed ornamental grass for extra height and texture. Fillers are shorter, and fill in the bulk of the space around your thrillers. Your supporting cast. They’ll grow upright or mounding, usually. I went with 6 of these little violas in shades of purple–I loved their contrast with the red geranium and they are very hardy. Plus, they were already in my pot. I planted them early in the spring for a bit of early color because they can survive a frost, knowing that I’d add more tender plants later. I also chose some finer, wispy lobelia to fill in the height between the violas and geraniums. That’s the pinkish-purple blossom you can see below, although I have some white in there, too. Spillers are the flowers or vines that will spill out over the edge of you container, the romance. My favorites are elysum for it’s tiny tiny blossoms that smell like honey, and sweet potato vine, for vivid broad leaves. (No actual sweet potatoes will grow.) Choose one or two kinds, and plant 2-5 of them, depending on your pot size. Now for planting! 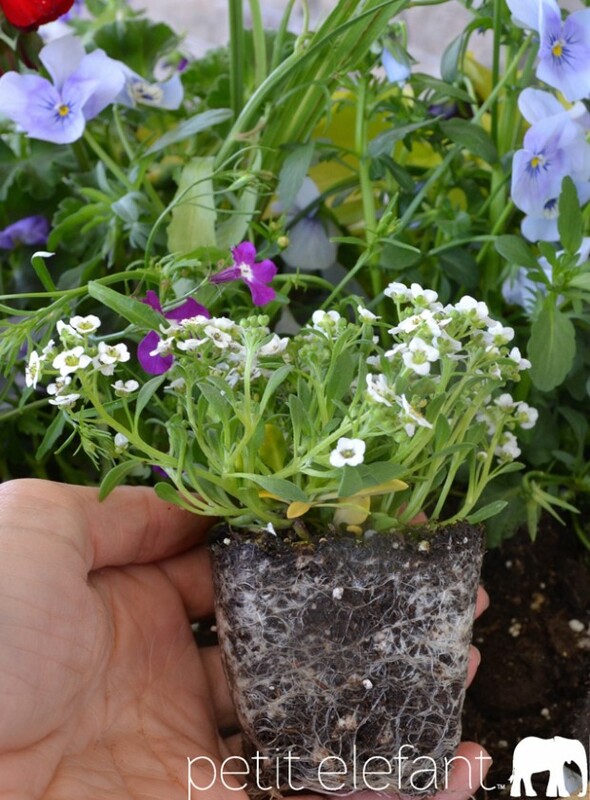 Loosen up your soil, and remove the top few inches. Reserve that soil for later. Starting with your thrillers, gently remove the plants from their nursery packaging. Give the sides of the root ball a gentle rub with your fingers to loosen them a bit, then gently place them into your pot, making sure to plant them up to the bottom leaves. Follow suit with all your remaining flowers and plants, and give it a good water. Don’t worry if it looks a little scant at first. With a good dose of sunshine and regular water (never water if the soil is still damp), these little beauties will grow quickly and fill in all the blanks. Gorgeous, happy, living color all summer long. Here is my pot about 2 weeks after planting. Now here, below, are my potted flowers after about 2 weeks, with mostly cloudy rainy stormy days. You can see they are already reaching and spilling and blossoming. After a healthy dose of warm sunshine they’ll start to go crazy. All pretty and happy, greeting visitors and brightening my day. 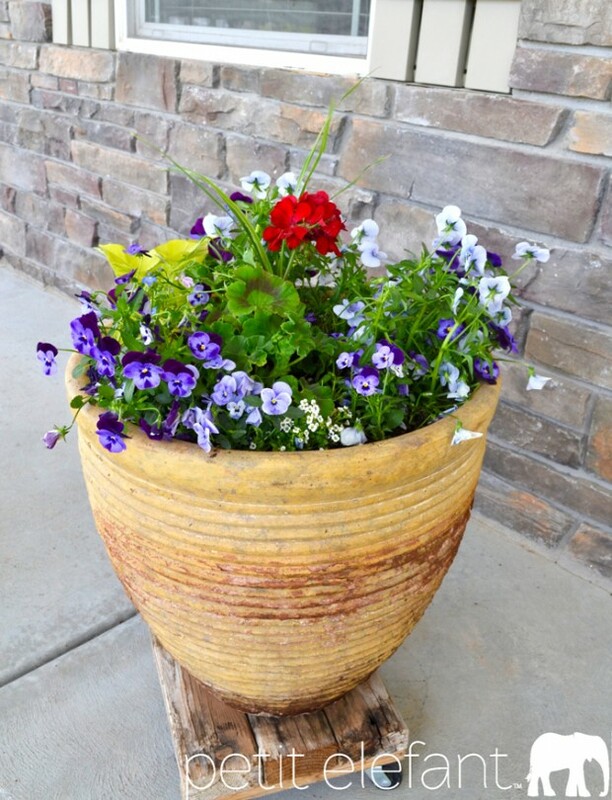 Note: If drought is a reality where you live, you can follow the same rules using succulents, and your pots will be every bit as beautiful as if you’d planted pansies and petunias. I particularly like this resource for ideas. 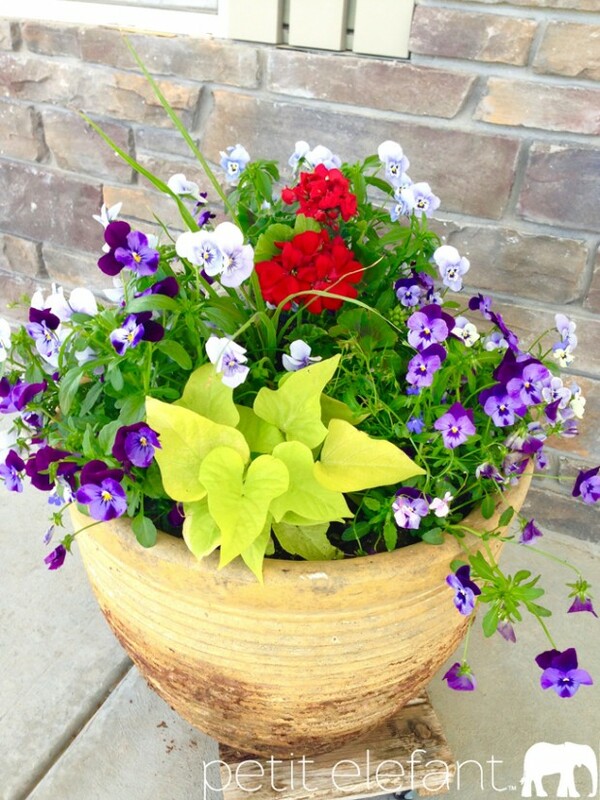 I’d love to know what your favorites are for planting in your flower pots each spring. What color schemes do you love? Do you have any other tips to share? << Do You Believe In Life After Death?